BOSTON — I’ve seen the faded red bricks of the Freedom Trail here a few times now. Well, usually bricks mark the trail. Sometimes the trail is marked by a thick line of red paint that runs down the sidewalk, over a curb, around the corner. Sometimes it’s just a lightly coated piece of park concrete that evades the benches and trash cans and then fades, leaving you standing by a spurting fountain wondering where the hell to go. Sometimes, when I reach those parts, I wonder whose job it is to make sure this trail has visible and safe bricks or a fresh glaze of fire-engine red connected in one continuous loop. And when I’m standing by that spurting fountain, turning 360 degrees attempting to rediscover the trail, I wonder where that person is. Maybe he or she checks the paint only in the good Freedom Trail seasons – which would be two, Spring and Fall – and let’s us struggle during the rest of the year. Maybe that’s the thing – who walks this 2.5-mile, undulating trail in the middle of August? I did, and I have two confessions. 1) We didn’t walk the whole thing. We just cherry-picked a few historical sites we wanted to see and ignored the rest. 2) We got perfect weather, inconsistent-Freedom-Trail-painter-guy-gal. In all seriousness, it’s a really cool outdoorsy thing to do when you’re in Boston. You get exercise, you see the town, you brush up on history. I’d highly recommend it. Here are five things that stood out to me on my latest visit. DID A SNOWBALL FIGHT BEGIN THE BOSTON MASSACRE? 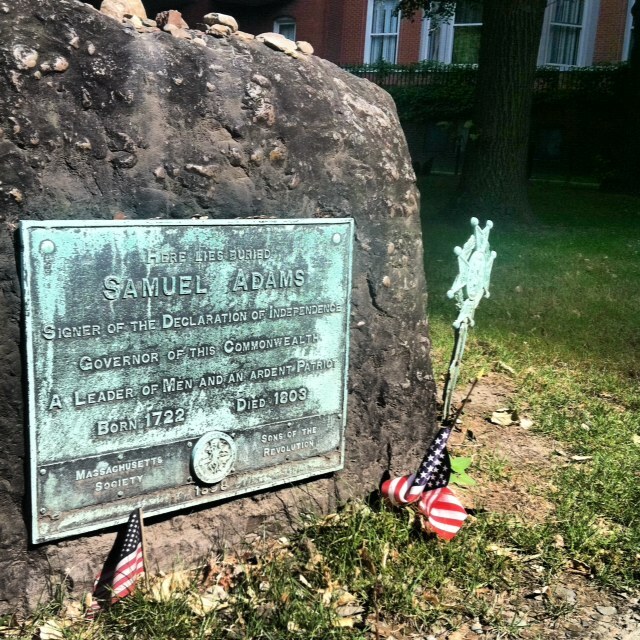 Our first top was the Granary Burial Ground, which we wanted to see because historical figures such as Sam Adams and Paul Revere are buried here, along with many signers of important pieces of paper in American history. I knelt at Sam’s tombstone to take a picture and read the faded teal plate on his slab of remembrance stone. He was a “Signer” and a “Leader” and a “Governor” and an “Ardent Patriot.” There were two small American flags pinned in the ground and a collection of pennies littering his grave. Maybe they were for good luck, or maybe they were a tip for the beer. Not sure. But not far from Sam’s grave is a sign. And the sign has a story. And as that story goes, on Feb. 22, 1770, a group of people gathered around Ebenezer Richardson’s home. He was a “Tory sympathizer and customs agent.” For unclear reasons, the crowd began assaulting Richardson’s home with snowballs. He responded in unthinkable rage, opening his front door and firing his shotgun into the crowd. Christopher Snyder, a 12-year-old boy, was hit in the stomach and later died. One of the striking things about the Freedom Trail walk is all the places where people congregated. There were government buildings and public churches and private homes, all now bearing signs that tell us about the important meetings that happened there. Today, many citizens vote absentee. We hold conference calls and Skype meetings. We can hear a sermon through a screen and a WiFi connection. We have more people, more facilities to accommodate those people, more technology to foster new ideas that invigorate and motivate those people … and yet it feels like the simple communal act of congregating is often lost in our culture. I’m sure that’s not technically true. People meet all the time at work, meet for lunches and coffees and smokes and drinks. And when you use simple math and multiply those small meetings by the large numbers of people in the world, well, you get a whole lot of meetin’. But when you see a place like the Old South Meeting House, it at least feels like whole communities are, in most places, no longer brought together. At this place, Benjamin Franklin was baptized. Phillis Wheatley, the first African-American author, went to church here. 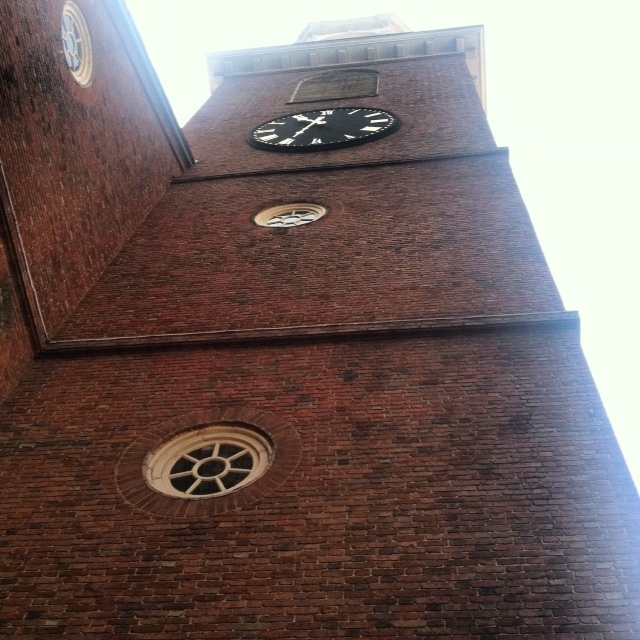 In 1773, colonists gathered here to protest the tax on tea and listen to Sam Adams initiate the Boston Tea Party. In the 1900s, this place served as a beacon of free speech, offering a place to voice opinions that were shunned by the ears of the general public. You can still feel all this history and all these people now. But then you look around and realize that a place formerly committed to a free marketplace of ideas is now just an old brick building engulfed by brooding office complexes and different venues of commerce. The first thing you see exiting the front door is a Chipotle across the street. I laughed. I mean this as a compliment: If you live in the North End, the Italian district of Boston, how is it possible to weigh less than 300 pounds? Everywhere you turn, there’s fresh spaghetti and homemade meatballs and crusty bread hot out of the oven and an Italian grandmother’s lasagna and bottles of red wine, all of which is finished with a cannoli at Mike’s Pastry. The problem is that all of this stuff is so good. It’s not mass produced. It’s not rushed to the table. It’s not crafted from second-rate ingredients. It’s astonishing the amount of quality food places in just a few blocks of each other. If I lived there in the long, cold months of winter, with the snowy nights and bitter winds, I think I would bathe in marinara sauce. 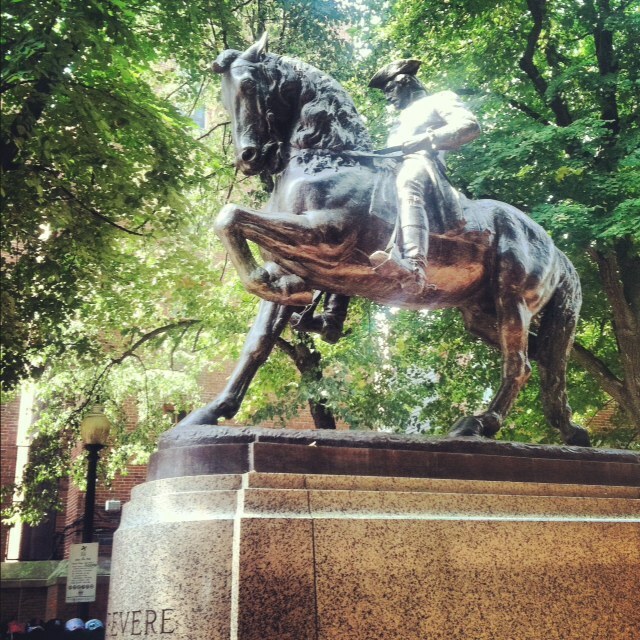 This was one of the things I wanted to see most on the Freedom Trail, because I really wanted to see the famous statue of Revere and his horse. I had seen the statue on postcards and on commercials and on those digitally altered openings to Celtics games, the kind where networks take shots of iconic views of a city, mash them together with some funky, enhanced colors and speed them up so it looks like everything is moving 100 mph. I think those are kind of cool, and I liked the Celtics one that showed Revere’s statue. For some reason, I had this image that it was located in this open space, giving it a larger and more important feel, like a monument. But anyway, we walked to the statue after visiting Revere’s house, and I was kind of surprised by it: It was modest and lined by trees in this elongated little park. I expected more people, and I expected it to be something that really stood out and marked the landscape. 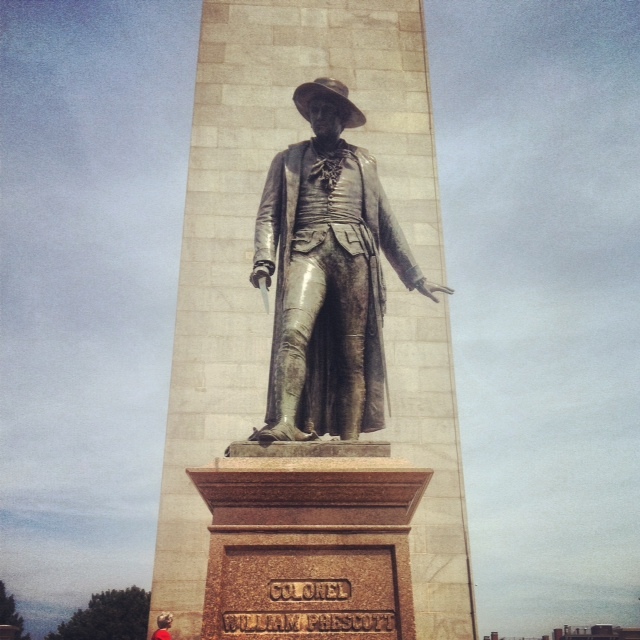 The coolest thing we saw on the Freedom Trail – by FAR – was the monument at Bunker Hill. How come this is not mentioned in the same breath as the Statue of Liberty, the White House, the Washington monument, the Smithsonian, Mount Rushmore, et al.? After visiting, I’m convinced this has to be included in any conversation about the most mesmerizing and inspiring and important historical landmarks in our country. No, it isn’t the most visually pleasing landmark in the country. In fact, there are many pockets of beauty that are more visually appealing than Bunker Hill. It’s just a tall stone steeple-looking thing with a statue of Colonel William Prescott. But Bunker Hill’s beauty isn’t a visual beauty. It’s an atmospheric beauty, something that you feel. But when you stand there quietly, simply reading the words and thinking back hundreds of years about the ground on which you stand, the history sheds its layers of triviality and the spirit of this pre-America moment washes over you. You come to understand that where you’re standing right now, more than 225 years ago, the Patriots did not “win” the battle against the British, but that wasn’t the point. The Patriots drew British blood — a HELL of a lot of British blood — and what they won was hope. What the colonists won was the realization that they could fight and that, more importantly, there was something to fight for. And it’s at this moment you realize you’re standing at the essential beginning of the Revolutionary War, at the true birthplace of this country. It’s almost too perfect – looking back towards downtown Boston from Bunker Hill, through the rows of apartments and down the steep streets, has to be one of the best views of the city. I didn’t get emotional or anything like that. That wasn’t my intention. I just wanted to understand where I was, and I wanted to appreciate the significance of the soil I stood on. That quote is not meant to be literally correct. It’s probably not. I’m sure historians can poke holes in it. I’m not a history buff. But standing on Bunker Hill, that’s what I felt. And it was a powerful, Patriotic feeling. This entry was posted in Uncategorized and tagged Activities, Boston, Freedom Trail, Outdoors, Travel, writing. Bookmark the permalink. I enjoyed this post. I’m glad Sean pointed it out on Twitter. Oops. Cut myself off. Some people leave coins merely because they see that others have. Keep exploring Boston. There is always more to see. Thanks for reading, Maggie, and for clearing up the coins thing. That’s an interesting little story. I’ll be back — love the history of Boston.